You know those backup drives will fail someday —but online backup services won't. Every minute of every day, your work can be preserved offsite —and AppleInsider will show you how to start. You can do everything right, and still lose data. For instance, we have three external drives hooked up to the iMac that this story was written on, and still we lost work. That's because you need more than just some drives plugged in, you need a solid plan with contingencies. You need to think about it and then you need to do it. Have a plan for exactly how your data is backed up to external drives and precisely to where. What we've done on this Mac is have two of those drives as just extra storage space. Only one of them was being used for backing up, and while we did have a plan, the plan wasn't good enough. The plan didn't survive our hitting a problem and needing to reconfigure everything. We assumed it was all still working as it had been and that's why we lost data. To be fair, it's not the greatest amount of data in the world ever. It's a FileMaker Pro database and we've lost maybe seven entries in it. Then to be even fairer, the solution to preventing this loss really should be using and properly configuring a service like Backblaze. So, let's talk about it. And, how it's not enough just to subscribe —you've got to put some work into it. What's happened is that we're in the middle of moving to an external drive so that we can boot our iMac without using its creaking internal one. That's just a case of using Carbon Copy Cloner and we've done that yet somehow we've convinced Backblaze.com that we're starting anew. It appears to be backing up all 3TB of data from our external drive even though 99 percent of it is the same as the internal one was. It's not supposed to do that and we are having an email discussion with Backblaze about what's gone wrong —but you noticed that 99 percent figure. That's not quite the same as 100 percent. 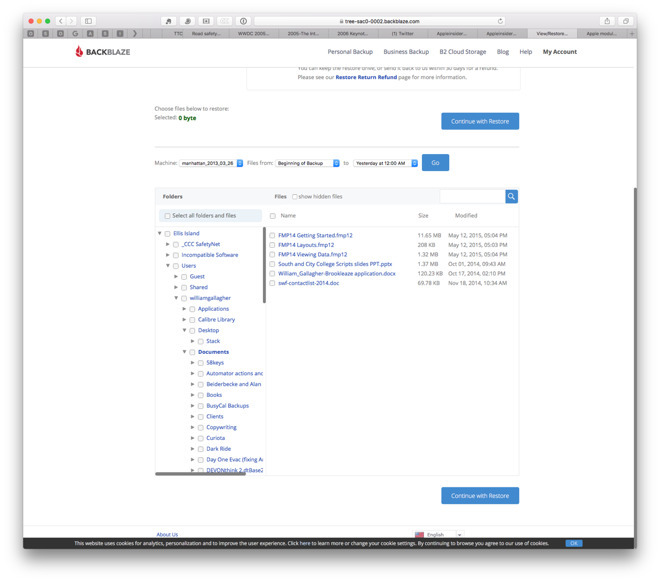 Last Friday, a FileMaker Pro database crashed on us —blame an elderly iMac —and we didn't notice at the time that it lost some data. Not much at all was lost, but enough that we turned to Backblaze to retrieve the latest version of it. Except Backblaze hadn't gotten to that database yet. So we're out these seven entries in a database and we can't get them back. In the short term, we're hoping that the Backblaze company will figure out the problem with our cloned drive setup. But, that's the part that's on us, and the lack of work we put into solving the problem in the first place. We're hoping that it will recognize that the new external drive has the same data, or mostly so, as the old internal one. It won't get back this lost data but it will mean everything from now on is fine. If they sort this out, then every thing we create on this iMac from then on will be backed up to their online service. We've been doing this for the last four or five years and on the odd occasion we've needed to restore a file, it's been quick and easy. If they don't sort it out, then we won't be safely backed up until it completes uploading the 3TB. With this AppleInsider location's poor internet speed, that's a long time. Seriously. Right now it's saying we'll have everything backed up in 1,117 days time. Even the Backblaze support page that calculates this starts its message with the words "Freak out." There are options in Backblaze to speed it up a little but really it's down to that poor internet connection of ours. While we hope yours is faster, it's still the case that your very first backup is going to take a while. Possibly a long while. Not three years, mind, that's just ridiculous. This is when we realize this iMac is so far from the internet that we would be quicker describing the data over the phone. What happens with any online backup service is that first it copies up absolutely everything to its own servers. You can tell it to exclude certain files and it won't bother with macOS or your applications. Otherwise then, by default, if it's on a drive connected to your Mac, it gets uploaded. 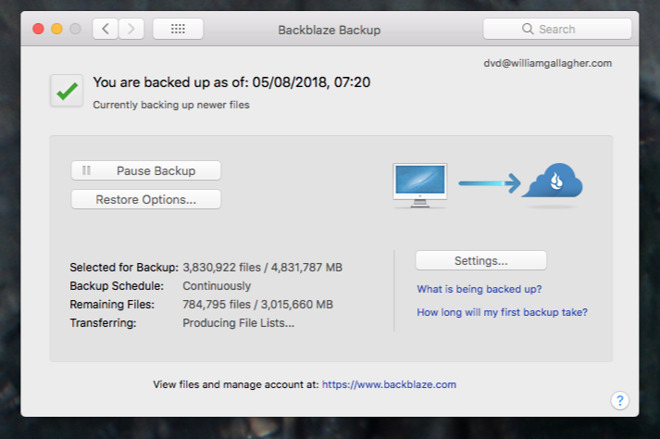 Once that's done, Backblaze works continually to backup everything you do, pretty much as you do it. That file you created this morning? Backed up. It is a very good feeling to know that this is happening. Trust us, we had that very good feeling until about ten days ago. We want it back. We'll get it back: we will feel good again when we know everything is backed up and every single thing we ever do is being backed up as we do it. Get this feeling for yourself. Maybe you shouldn't ditch your external drives just yet, even if we're currently contemplating throwing one of them out of a window. Just also get yourself an online backup service and do it right now. You won't be safe until all of your data is backed up on it, but no matter how long that takes, it's quickest if you start now. Immediately. Seriously. This is how serious we are. While it is galling that we've lost these seven little database entries, we have to compare that to many years of reliable backups and —what's more —reliable restoring of deleted files too. Consequently, we recommend Backblaze highly. Excuse us while we just choke a bit on that. This problem will pass. And if they haven't solved the problem yet, Backblaze's online support people have been working on it. We've no complaints about the attention we've been getting. Dropbox, OneDrive, iCloud, Google Drive, they are all superb at meaning your work is with you wherever you go. Whichever device you use, whenever you need something you've saved, it's right there. They are working drives. It's online storage versus online backup. With Dropbox and the rest you're saving work there that you intend to use, to change, to update. 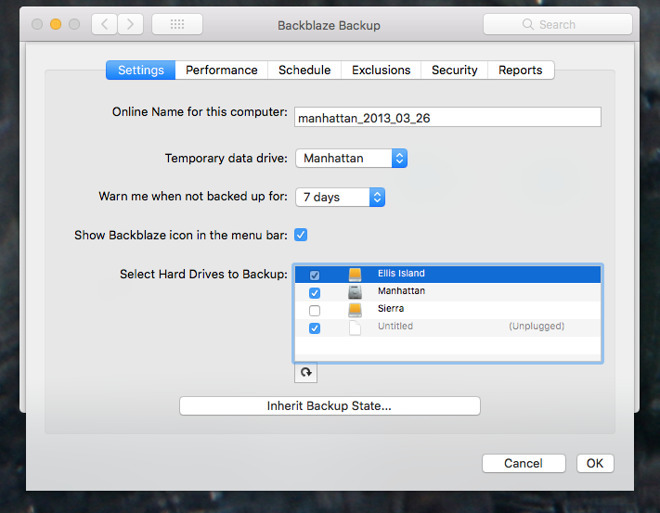 With Backblaze and some alternatives, you're saving your work to a backup in case of problems. So we have Dropbox and iCloud and all the rest but the files we save in them on our Macs or on our external drives are also being backed up to Backblaze. The aim with this is that after we set it up right, we don't have to keep checking. We don't have to think about it, don't need do anything about more it, and we just know it's all being backed up. When disaster strikes, then we can just grab back a file. If you save all of your work, all of your documents, absolutely everything that is important to you, into Dropbox, then you could be okay. Dropbox automatically keeps copies of files up to 30 days after deletion and if you're a business user paying more, you get longer. You just also have to pay for all that space. Dropbox gives you 2GB of space for free. It's quite a leap from 2GB to the next tier, a paid-for one called Dropbox Plus that gives you 1TB for $9.99 per month. Then there's Dropbox Professional which is $19.99 per month for 2TB. You'll notice that's still not the 3TB we'd need for our little local difficulty. To get 3TB you're into Dropbox Business and the company negotiates a cost for that depending on the number of users you have. Even if we just needed 2TB, though, that works out to $239.88 per year. By comparison, online backup services are both cheaper and give you more space. CrashPlan for Business is $120 per year for a single Mac, for instance. Carbonite is $72 per year. Backblaze, the one we use and usually swear by instead of at, is $50 per year. What's more, though, is that as this is passive storage rather than working files, you get more space. Backblaze is typical in how it doesn't limit how much data you backup. Right now we have this 3TB internal iMac hard drive and a clone of it in an external but we also have two other drives plugged in. Backblaze backs up the lot. It's when you need to restore a file that you see the difference between working drives like Dropbox or iCloud and backup storage like Backblaze. This is like the difference between the files on your Mac and the files on the external drive that you store at your mother's. You know it's safe away from your house so it won't get stolen along with your Mac. You trust your mother not to look at it all. It just takes a while longer to get the files back if there's a problem. Not much longer, though. To restore a single file or a handful of them takes us a few minutes and then they're downloaded right to our Mac. Compare that to iCloud which offers a similar way of downloading deleted files. You have to log on to icloud.com, then go into Settings and scroll down for Advanced and then choose Restore Files. Then iCloud is slow to list all the possible files to restore and it's slower still for you to find what you need. You just get a straight list of files that have recently been deleted: this is exactly the same idea as Photos on your iPhone. 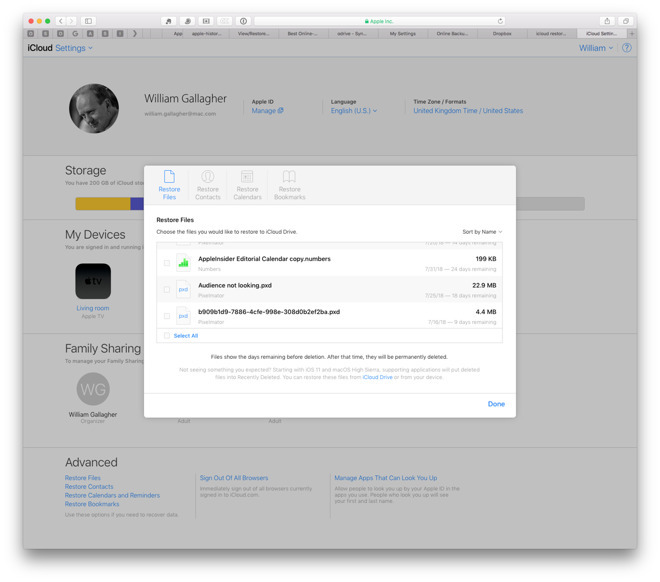 Items you delete on iCloud get moved into a Deleted Items section and left for up to 30 days. It will save you for the odd file, it's no use for more than that. Online backups keep copies of everything and you can go back to yesterday's data, the day before or two weeks from last Tuesday. This is very much like Apple's Time Machine, except not as visual or friendly, and also not on a drive in your house. If you need more than one file, if you need your entire hard drive restored, then it's true that it would take longer to download it all from an online service than from Time Machine. However, Time Machine isn't fast —and you can pay online services to send you a physical copy. Backblaze quotes $99 for them to send you up to 128GB of data on a USB drive, for example, or $189 for a hard drive up to 4TB. We'd call that a bargain on its own for getting all your data sent to you with a variant of the old "sneakernet" or "station wagon full of tapes" method from back in the day. But online services typically do one thing more: they'll refund your money when you send them back the USB stick or hard drive. You've spotted that we recommend online backup services, we've been pretty clear about that. We've been only slightly less clear that we also recommend working drives like Dropbox and iCloud. What we've been substantially less clear about because of our current problem is that, yes, we do also recommend backing up to external drives. While we continue to talk with Backblaze about our specific problem, though, we are also taking steps to protect this particular database. From now on it will be cloned to an external drive and back again, it will be backed up online. We're just also going to tell Hazel to make a copy of it onto both Dropbox and iCloud every day. All that because we lost seven tiny entries in a database. Imagine how you'll feel when you lose something bigger.